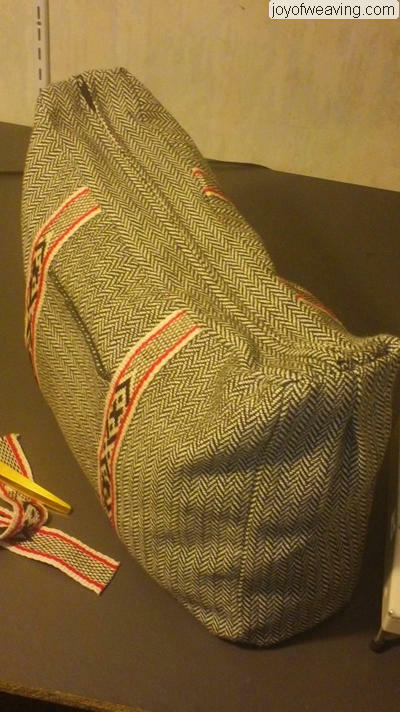 I started a sampler for making Norse Leg Wraps with tubular selvedges and doing the selvedges was so tedious that I switched over to just weaving for the herringbone twill. That left me with a 5 yards of 5" wide sampler. I'm not one for tossing out handwoven anything so, I decided to cut it into pieces and sew the panels together to make a wider cloth. I had just enough to make a purse plus pockets. This was all intuitive sewing, there is no pattern. 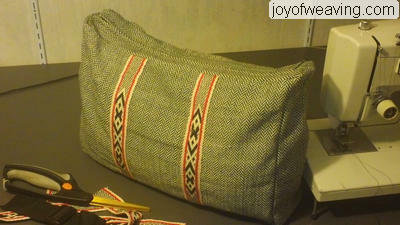 I took an inkle woven band, that I made when I was first learning to do pick up, and used that for decoration. 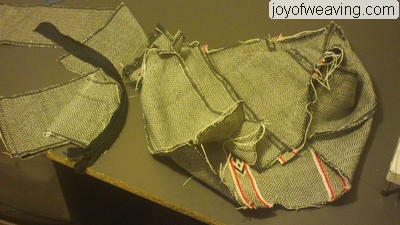 All I need to do now is duplicate the bands, (only a little wider) and then use them as the straps for this purse. I took the zipper and hardware off a backpack that has been sitting in the back of the spare room closet for years and years. I thought this would make better use of it. 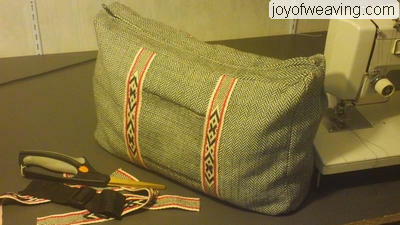 Front of the purse: The pickup woven band I did works great for hiding the area where the strips are sewn together. I butted the ends next to each other and used a zig zag stitch to join them. The pickup woven band, with the join in the center of the band, sewn on the selvedges to the underlying cloth, "cements" the join. I turned a piece sideways between the bands to make a contrasting pocket. I have pockets on the inside as well but they're hard to photograph.